Chat with friends, check notifications or your achievement progress by pressing Shift+Tab in supported games. Customize the Client to your needs by selecting features you want to use, for a personalised experience and no feature-creep. GOG Galaxy downloads as fast as it can, but sometimes you might want to limit that. And you can schedule limits too. Rewritten from scratch, it lets you stay connected with friends when playing a game or when using the Client. GOG Galaxy is out of beta - only new preview features will be beta limited. Press F12 in games supporting in-game overlay to capture that epic moment. On top of making GOG Galaxy even faster, auto-hibernation drastically reduces CPU usage when idle or playing games - to save your precious resources. Control and customise Client’s features from the new settings window. Overlay includes frames per second counter to measure how well does the game perform on your glorious PC. Whenever you unlock an achievement you will see how common or unique it is among GOG community. 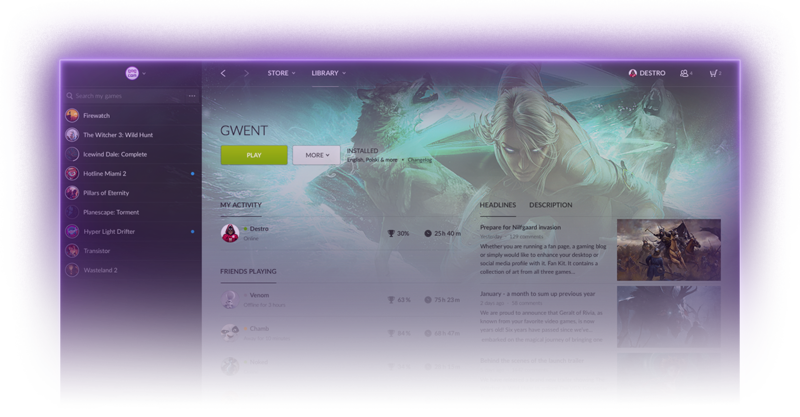 Receive new messages, game invites or friend request notifications when in-game or when GOG Galaxy is in the background. The gaming Client designed for a convenient purchasing, playing and updating games, as well as an online play between gaming platforms, GOG Galaxy is also built with optionality in mind, and a belief that you should own the games you buy. GOG Galaxy Client requires Mac OS X 10.11 or newer. Also available for Windows. GOG Galaxy Client requires Windows 7 or newer. Also available for Mac OS X. Installing, updating and syncing saves - with you in charge. 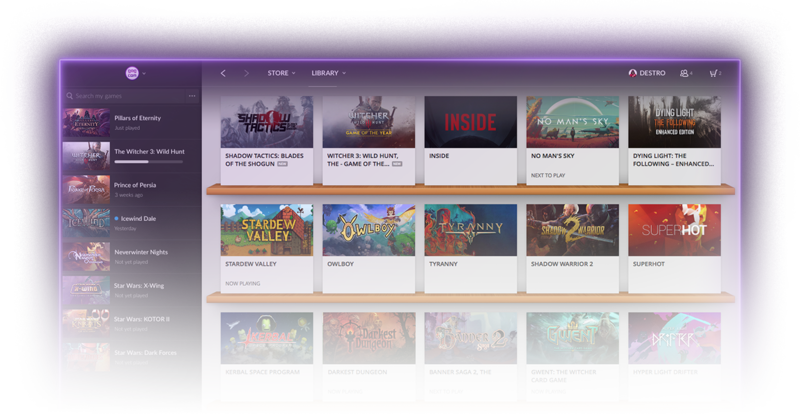 Install any game with a single click, and GOG Galaxy will keep it always up to date. Optional bandwidth limiting and scheduling gives you additional control. It’s up to you when and how to play your games. GOG Galaxy will always work without an internet connection, and so will your GOG Galaxy installed games. Sometimes game updates break things. Thanks to the built-in Rollback feature, you can restore your game to prior states with just a single click. Don’t like being forced to update? In GOG Galaxy you can turn off auto-updating for any game and receive notifications when new updates are available. Enriching games with additional features, online and offline. Unlock achievement laid out by the developers and track your playtime. Win bragging rights or just do it for the sake of your inner completionist. For all overlay supported games, you can capture a screenshot to immortalise that epic moment - simply press F12 when the time is right. 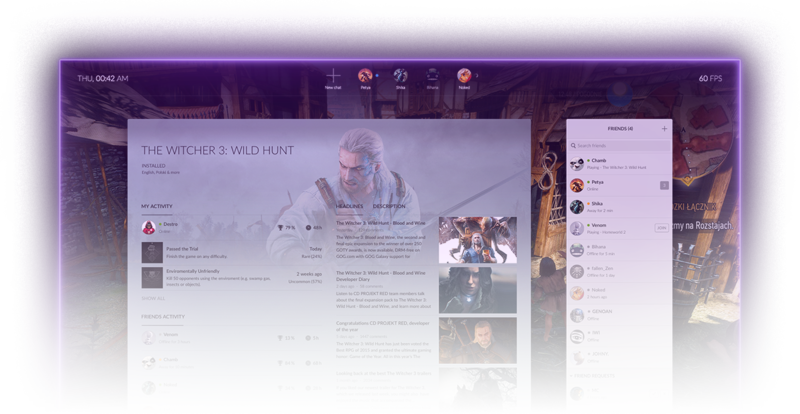 GOG Galaxy-powered multiplayer games offer matchmaking and online play. In new and classic games alike, meet other players and make friends... or enemies. Crossplay-enabled games offer online play between GOG and Steam. Because where you buy your games shouldn't prevent you from playing with friends. More ways to build friendships and stay in touch. Add people you like to your friends list. Keep track of their activities, see if they are online, what are they playing, start a new chat or invite them to a game. No matter if your friends are playing a game, using GOG Galaxy or browsing GOG website, you can always chat with them. Stay connected! Small details can sometimes make the biggest difference. GOG Galaxy is about freedom of choice. Not into achievements? Desktop notifications distract you? Adjust the Client to your needs and stay clutter-free. We deeply respect our users, so we’ve also built GOG Galaxy to respect your privacy. We don’t track your personal data... we don’t even look for it. 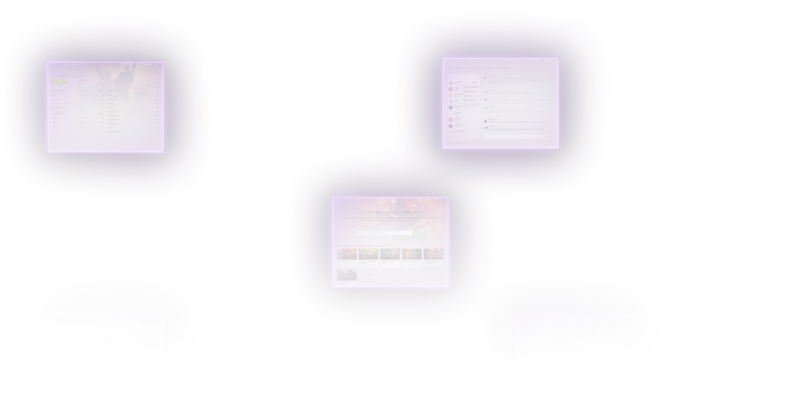 No matter if GOG Galaxy sleeps in the background or if you are playing a game, you won’t miss that new message, invite for a round of multiplayer or a friend request. We believe that GOG Galaxy should be as lightweight as possible, and with every version we do our best to decrease its CPU footprint. Beyond all these features, GOG Galaxy will never be mandatory. And that’s great motivation for us - we want to make it so good, that you actually want to use it. 1. Why create GOG Galaxy? GOG Galaxy is as much about bringing the GOG.com experience up to modern par, as it is about offering completely new features and standards. GOG Galaxy will make it possible for us to support new games that require online features, but it’s equally important to offer an even better experience to our existing users, and to support our community in seamlessly transitioning between our website, into games, and inbetween. We're introducing quality of life features and the means to stay connected whether you're in your browser, in the client, or in-game. Most importantly, we want to redefine what it means to use a gaming client. 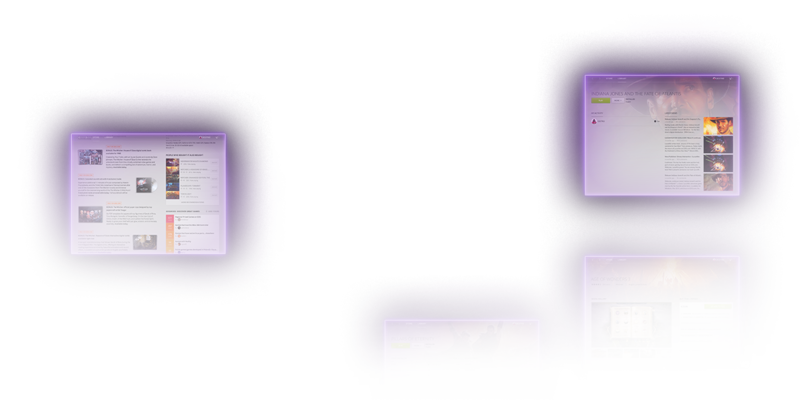 Most GOG Galaxy functionality is optional and toggleable, but we also want to introduce a few features that you haven't seen before. Like rolling back patches. 2. Can I use GOG Galaxy to install and update every game on GOG.com? Yes. You will be able to download and update every single game via GOG Galaxy - we call these the core features. Right now, a few games do not yet support the client - a list is available on our support pages. Our aim is to include support for every single game as soon as possible. 3. How can I tell which games offer specific Galaxy features? Core features (like installing, updating, game time tracking) will be available in every single title. In-game and social features might not be, so we'll make sure that all supported features are listed clearly on a game's page. 4. Will games and patches be available for download via website and GOG Galaxy at the same time? We will release all of our games simultaneously through GOG Galaxy and the website. Updates, however, can be more efficient in GOG Galaxy - it's largely the reason we made it. By automating the update process in the Client, we'll be able to get patches distributed quickly while we continue to manually package and test our standalone patchers. In short, we'll get the updates out as fast as possible through both channels - but we won't delay one on account of the other. 5. Where can I report bugs / feedback? Bug reports: Our http://mantis.gog.com will stay active, where we can directly interact with you to squash any issues. Feature requests: We have a new wishlist section dedicated to requesting, and voting on, new features in GOG Galaxy. General feedback: We encourage you to discuss GOG Galaxy on our forums, and we'll be monitoring the threads to gather feedback and new ideas. 6. Can I buy games via GOG Galaxy and access the forum? Can I forget about my browser and only use GOG Galaxy? 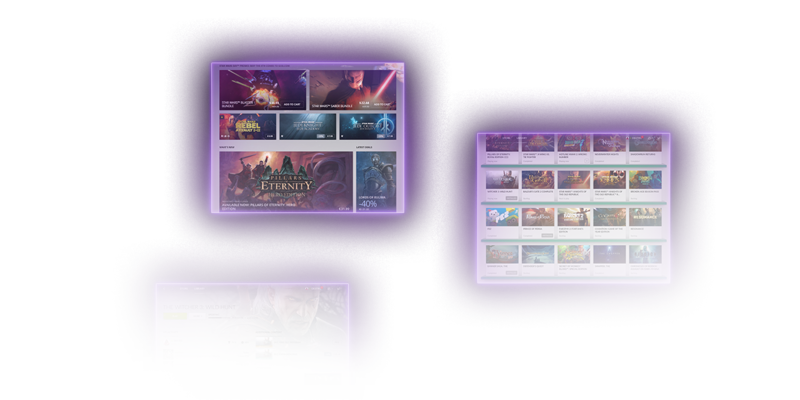 GOG Galaxy supports all of the current website functionality, that includes buying games through the client and participating in the forums. The GOG Galaxy client should work as a full replacement for the website if you want it to. 7. Does GOG Galaxy collect my personal information? We respect your privacy, so does GOG Galaxy. The client won't upload any more of your information than is necessary to function. For example, we will never scan more of your hard drive than you tell us to, and when we track your game-time, we will never upload the names of your system processes, let alone anything else. We save your playtime only. If you let us. 8. Will you still support GOG downloader? Will you develop it further? We won't disable the GOG downloader on launch day, but we will no longer actively support it. The downloader may be affected as we continue updating our infrastructure, but we don't plan to disable it intentionally. 9. Will you release a Linux version of GOG Galaxy? A Linux version of our client is planned eventually, but we don't have an expected release date right now. Stay tuned for future announcements! 10. Can we edit, modify, or tweak GOG Galaxy? If you like to tinker, feel free to start building your own features or even entire clients compatible with GOG Galaxy, assuming you can figure things out right now. We won't actively work against attempts to improve the GOG Galaxy experience, although we can't promise not to break anything as we continue to develop our own tools and infrastructure. 11. I have a lot of games installed on my PC already. Will GOG Galaxy detect my games, or will I have to reinstall the entire library? You can add your installed games to the Client. Games installed with our newer installers (available on the website for a few months now) will be detected automatically, older installations will require you to add the game manually. 12. How can I start using cross-play? Cross-play doesn't require any setup or configuration. Steam users won't need to create GOG.com accounts or install GOG Galaxy, while GOG.com users won't need to create Steam accounts. Just log in, launch your game, and start playing online! 13. Is GOG Galaxy truly optional? GOG Galaxy is fully optional because you don’t need it to play games on GOG.com. If you want to, you can simply download your game via your browser, install it manually, and launch it offline, just like we've always done it on GOG.com. If you decide to use GOG Galaxy for some aspects of the convenience, you can still switch to offline mode at whim and play your games. Optional also means that all features in GOG Galaxy can be turned off. Not a fan of achievements or auto-updates? No problem, they're extras. Made with love in Warsaw, Poland. Share your feedback or send bug report and help us to make GOG Galaxy even better.